Tomado de “Vision Quest in a House of Mirrors” publicado en el Libro de la Exhibición Deep-Action. Fantasy need not dwell on the sunny side of the street. The work of Arturo Miranda Videgaray draws on a dynamic history of the macabre. He seems obsessed with a view of the world befouled by toxins and the by-products of civilizations and is, of this group of artists, a true expressionist in the vain of Francis Bacon or Orozco. Perhaps his nightmares of pollution stem from his living in Mexico City with its notoriously bad air quality. 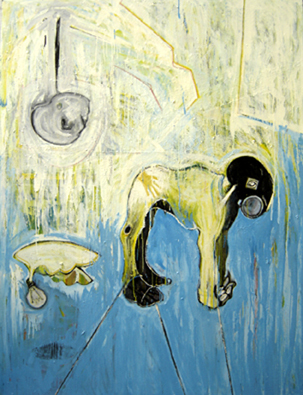 Figures with short torsos and large feet wear strangely shaped gas-masks and materialize out of dense thickets of urgent brush strokes and rivulets of dripping paint. They are clad in protective suits as if to deal with toxic materials. A bent over figure looking like a dog and walking on all fours, hands turned palms up, is a recurring subject. “A través del Aire” (2004) pictures two visages in a field of yellow. Large planes of painterly strokes form membranes of transparent pigment which reinforce the contours of form through the repeated applications of paint. Drips of paint run to the bottom of the canvas, anchoring the composition and owe much to the doctrines of the Abstract Expressionists. 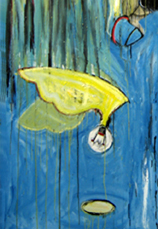 In the blue foreground hovers an apparition looking like a light bulb with wings. In a series of drawings with collage components “Libro-objeto Ignominia” (2002) Miranda Videgaray constructs drawings of bodies from cut out pictures of mutilated victims. This grisly practice addresses not only the degrading nature of violent deaths but seems to reanimate the dead showing the redemptive nature of art. Colgado. Hängend. Hanger. Óleo / Tela. Öl / Leinwand. Oil / Canvas. 170 x 130 cm. 2006. México.